I continue to experiment with combining image 2d and 3D software packages, including Dogwaffle Howler, to achieve the best effect. Here a Bowhead Whale (Balaena mysticetus) surfaces off a rocky, snow-covered coast. Abundant ice from a nearby glacier floats in the water. 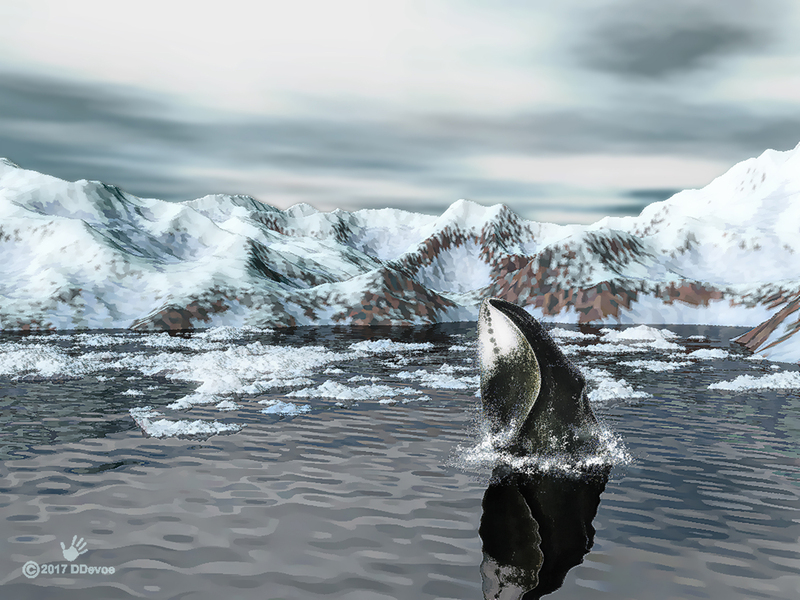 The Bowhead is also known as the Greenland Right Whale or Arctic Whale. Adult Bowheads are entirely black except a spotted white patch at the front part of the prominently upturned lower jaw. Unlike other whales which migrate to southerly waters to feed and reproduce, it spends its entire life in the Arctic. Bowheads, have no dorsal fins and, with their massive triangular heads, can grow to the length of 60 feet (18 meters) and weigh in at 100 tons. Bowheads have been reported to have broken through ice two feet thick. The bowhead has the largest mouth of any animal. Whalers severely reduced the numbers of Bowheads until a moratorium was instituted in 1966. Since that time the population has somewhat recovered. Click on the image for a full-sized view. The Icelandic whaling ship Hvalur 9, sailing a blood-red sea, fires an explosive harpoon at a group of fleeing Fin Whales. Iceland is set to resume killing Fin Whales this year in contravention of an International Whaling Commission (IWC) moratorium. We learned recently that meat from the endangered Fin Whale was being made into luxury dog treats in Japan. “The most likely reason for shops to sell the whale meat dog treat is to target affluent Japanese who want to show off their wealth with something different,” said Nanami Kurasawa, executive director of the Japan-based Dolphin and Whale Action Network. “The product description identifies the meat as being Fin Whale of Icelandic origin. Its use in pet food suggests that new markets are being explored.”Due to international public reaction the company has just announced that it will cease manufacturing the treats, but Fin Whale met will still be imported and sold for human consumption. The same firm also makes dog treats from Mongolian horses and kangaroos. It seems to me that the much-touted Japanese love of nature stops at the waters edge of the home islands. 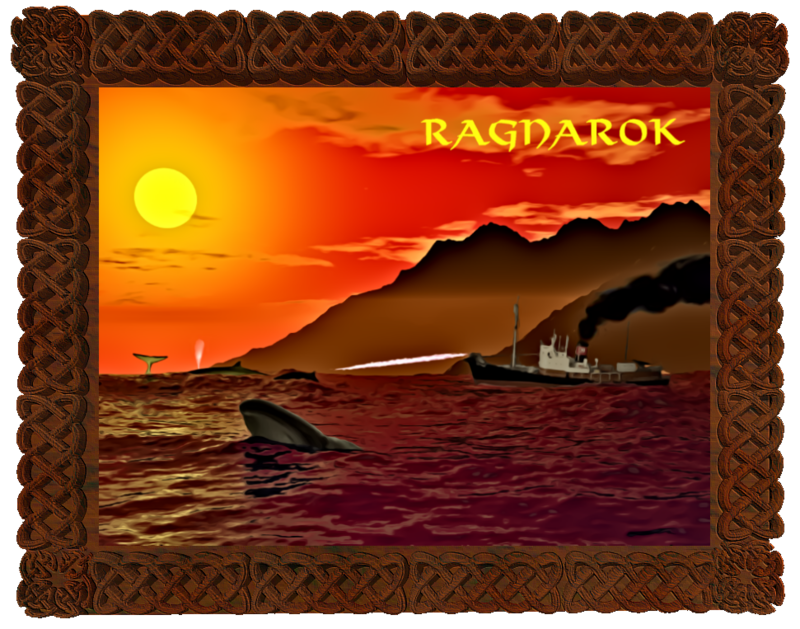 Ragnarok is the Norse end times legend. Ragnarok will be a great battle resulting the destruction of Valhalla and the deaths of several of the Norse gods: Odin, Thor, Týr, Freyr, Heimdallr, and Loki. A number of natural disasters will occur, and the world will be submerged in water. The catastrophic nature of Ragnarok seems appropriate given the resumption of hunting this endangered species. The Fin Whale is believed to be the second largest animal ever to have lived on the planet after the blue whale. A full-grown adult can be almost 90 feet in length and weigh 75 tons. Fin Whales are extremely fast, they can outrun most any vessel. They usually ignore ships, but will occasionally race vessels, smashing into waves on a parallel course at a safe distance. Such speed enabled them to avoid the near extermination suffered by the slower Right Whale until the invention of steam, and later, diesel engines; and the introduction of explosive harpoon heads. In the 1950s and early 1960s, 30,000 Fin Whales were killed each year. Between 1905 and 1976, 725,000 Fin Whales were reportedly caught in the Southern Ocean, 74,000 in the North Pacific between (1910-1975) and 55,000 in the North Atlantic (1910-1989). Japan has killed 18 Fin Whales in the last eight Antarctic whaling seasons (ten in the southern summer of 2005-6, three in 2006-7, zero a year later, one in both 2008-9 and 2009-10, two in 2010-11 and one in 2011-12). The score was zero again this year. Since the season of 2007-8, they had allocated themselves a quota of 50 Fin Whales per year, but the ever more effective interventions by Sea Shepherd have prevented these slaughter numbers. Greenland has an IWC quota of 19 Fin Whales, the North Atlantic subspecies, per year. Greenland wanted to increase their ‘large whale’ quota, but this was refused, because investigations showed that whale meat was freely sold in over a hundred stores in Greenland and was served in tourist restaurants as ‘whale barbeque’ or ‘Greenland sushi.’ Greenland kills whales under an aboriginal permit that demands that all the products from the killed whales must be used for the subsistence of the original human population. The Greenlanders however went commercial with whale meat even making it available in Denmark shops. Earlier this year, Greenland did what all the whale poachers of the world do when they disagree with the IWC – they ignored this impotent body’s decision and set their own quota – but they kept their fin whale take at 19. Commercial whaling was discontinued in Iceland in 1986 when the IWC moratorium came into effect, but they used the familiar so-called scientific whaling excuse until 1989. Most of that catch was used as feed on fur farms in Iceland. In 1992, Iceland left the IWC, but could not resume whaling as IWC member Japan was not allowed to import whale meat from a non-member. They rejoined in 2002 with a reservation to the moratorium. In 2009, they set their own quota at 154 Fin Whales per year. That year, they caught 125 of these animals; 148 a year later. In 2012, Iceland decided for the second consecutive year not to kill Fin Whales. In 2011, there was no demand for whale meat in Japan as a result of the earthquake and tsunami occurring in March of that year. The earthquake reportedly damaged two of the whale meat processing plants with which the Icelanders do business. Business? Yes! Where the appetite for Minke whale meat is small in Iceland, the market for fin whale meat is non-existent. The hunt is only pursued for the export profit from Japan, a glorified subsidizing scheme as Japan’s warehouses are full of unsold whale meat, but that nation fears the day that they are the last slaughterers of whales on the planet. Sea Shepherd is in the forefront of the effort to protect whales and other marine life. Visit Sea Shepherd’s web site and/or support them by buying t-shirts here.